Description: Another important piece of safety equipment is the fire extinguisher as shown in the photo to the left. Make sure you know the location of all fire extinguishers in the shop. This will be important especially if you are in a hurry to put out a fire. Also, make sure you know how to operate them correctly. It is also important to know the different types of fires that can occur in a typical shop. 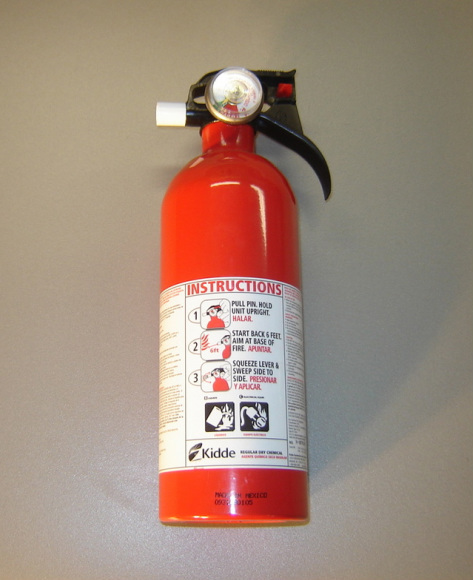 Only certain types of fire extinguishers can be used on certain fires. There are four major classes of fires: Class A, Class B, Class C and Class D. These types of fires are classified by the type of fuel that is involved. Class A fires--The fuel involved is typically wood, paper, cloth, rubber, plastics, rubbish, upholstery, etc. This type of fire usually requires cooling and quenching to be put out. Class B fires--The fuel involved is typically gasoline, oil, grease, paint, lighter fluid, etc. This type of fire requires smothering and blanketing to be put out. Class C fires--The fuel involved is typically electrical components, fuse boxes, switch boards, etc. This type of fire requires a nonconducting agent to be put out. Each fire extinguisher shows the type of fire(s) that it can put out by pictures and by listing as Class A, B, C, and/or D fires on the fire extinguisher. The most common types in a street rod shop show a picture of a waste can with fire (Class A), a gasoline can with fire (Class B), and an electrtical plug with fire (Class C). Note pictures on the label in the photo above. This fire extinguisher should be used only for Class B and C fires. Also, make sure the dial on the top of the fire extinguisher shows the needle in green, which indicates the amount of charge left.